Eric Curbishley is a local military researcher, who in November 2012 very kindly provided this information about the War Memorial in Thornton. Just in time for Remembrance Sunday 2015, Eric Curbishley has published his new book entitled “Thornton Cleveleys War Memorial and the Men and Women Behind the Names” Second World War. 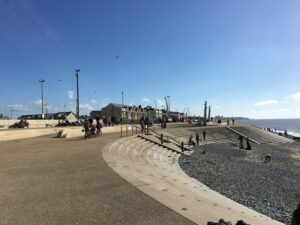 The Second World War Memorial at Thornton Cleveleys has 29 more names on it than the First World War Memorial and therefore there are an additional 43 pages in the new book. 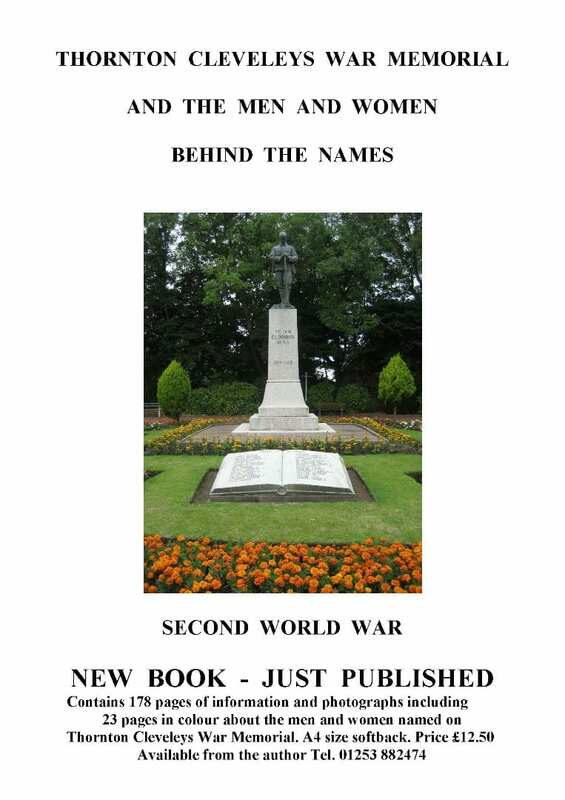 Eric first wrote a successful first book about Poulton War Memorial in 2011 entitled “Poulton-le-Fylde War Memorial and The Men Behind The Names” which covers both World Wars (a few copies of which are still available).  He then decided to take on a much larger project and research Thornton Cleveleys War Memorial and in 2014 published a further book entitled “Thornton Cleveleys War Memorial and The Men Behind The Names – First World War”. Eric also shares his own personal story of how the war touched his own family, which you can find here. If you would like to buy a book you can contact Eric on 01253 882474 or email eric.curbishley@gmail.com. In 1919 a temporary war memorial was constructed in Woodlands Avenue Thornton but in 1923 a permanent war memorial was built at Four Lane Ends Thornton. This memorial was officially unveiled on 11th November 1923, the fifth anniversary of the end of the First World War. 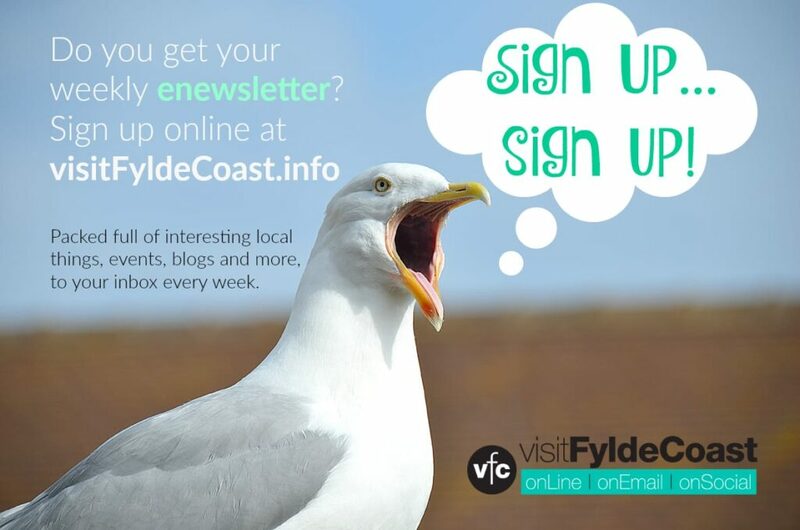 For most of the 19th century the main occupation of the people in the area had been in agriculture however this all changed when in the 1890’s the United Alkali Company (later to become Imperial Chemical Industries) built the chemical factories at Burn Naze, Thornton. The construction of the factories involved employing workers from outside the area and many of the men came from Ireland. When the factories were completed some of these men settled in Thornton Cleveleys and continued to work at the chemical factories or found other jobs in the area. Additional staff also moved to Thornton from the United Alkali Company’s other factories at Widnes. When war broke out in August 1914 many of the volunteers for military service came from not only local men but also from the communities that had settled in the area some years earlier. This is the reason why some of the surnames on the war memorial are not recognisable as local names from previous generations. 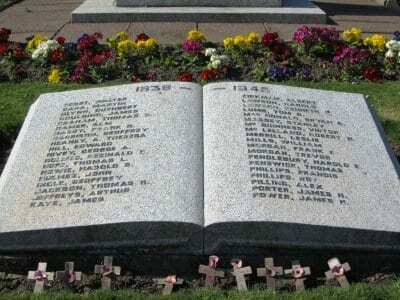 When the Second World War started in 1939 Thornton Cleveleys men and women were once again called upon to do their bit and the open book design which surrounds the original war memorial on which their names are inscribed bears testimony to their sacrifice on behalf of their country. Included in these names are those of three local women. The First World War memorial contains 84 names whilst the Second World War Memorial contains 113 names. When in recent years the Imperial Chemical Industries factories were closed down and demolished it became necessary to find a place in which to re-locate the Imperial Chemical Industries War Memorial commemorating company employees who died in both world wars. 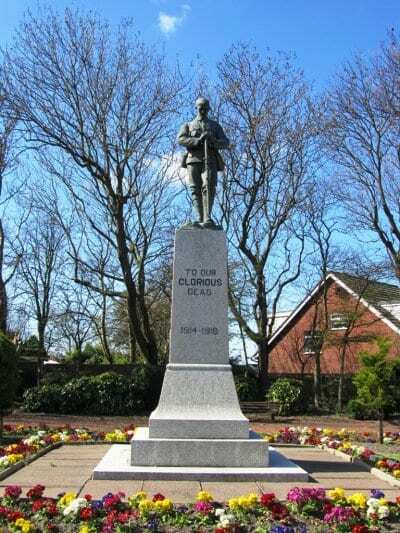 This memorial has now been placed within the confines of the Thornton Cleveleys War Memorial. It contains 50 names from the First World War and just 9 names from the Second World War. As would be expected many of the names are duplicates of those already on the main Thornton Cleveleys War Memorial. In 2015 the ICI memorial was refurbished and can be seen at Four Lane Ends. Take a look at the Events Calendar for the dates and times of this years Remembrance Sunday Services.